Get started fast with tutorials for Avid Media Composer. Lynda is a subscription site – Learn how to use video editing, notation, and recording software by Avid. Our Avid tutorials cover Sibelius, Media Composer, and Pro Tools. Taught by industry experts, our video courses can help you learn to compose scores for film, audio, and video projects. Official Avid Learning Partners are located around the world and offer a full range of Avid official courseware. A series of videos to teach AVID Media Composer. A collection of video tutorials explaining Avid tools and workflow. Mac Pro Video is an online education community featuring Tutorial-Videos & Training for popular Audio & Video Applications including Adobe CS, Logic Studio, Final Cut Pro X, and more. Aiming to be the number one Final Cut & Motion resource on the net. Tons of tutorials – mostly for their own software – but there’s some great stuff in here. A collection of tutorials for Twixtor, De-Noise and Flex. Free tutorials for Nuke & Flame. Teaches you about nodes, expressions and compositing. Larry hasn’t just read the book, he’s written the book, Tutorials on FCPX, Motion, Compressor and Premiere Pro. The Premiere Pro user blog and fanzine, which includes tutorials on Premiere. Ripple Training authors are producers, editors, motion graphics artists, and colourists with real world experience that are able to quickly get you up to speed on the latest dynamic media software. FCPX, Motion & Compressor. Videos and learning tools provided by Adobe. A good place to start for beginners. Learn from our creative video editing tutorials, camera tricks and film-making tips. Subscribe to see a new video every Tuesday! Want to learn to create awesome Visual Effects and improve your Film Making skills? 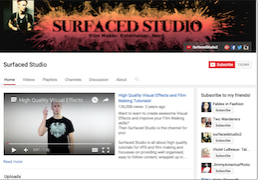 Then Surfaced Studio is the channel for you! Tips from DP Shane Hurlbut based around Premiere Pro. A collection of video tutorials explaining Adobe Premiere tools and workflow. ReTooled wil maximise standard desktop applications and streamline everyday tasks. We primarily feature tutorials on Adobe Premiere Pro, After Effects, Final Cut Pro and the occasional other tip or technique. Tutorial on color correction using After Effects and Photoshop. This method explains how to color correct most any footage “by the numbers”. A YouTube playlist with 200+ original After Effects tutorials. Text & image step-by-step tutorials for Motion Graphics and light effects for After Effects. A Short Film Stuff favourite – Andrew Kramer’s website full of amazing After Effects tutorials, most with project files included. Absolutely the best tutorial site ever. After Effects CC tutorials from movie to expert. Get started, get the essentials, get inspired! 52 amazing After Effects tutorials. Whether you’re a beginner, intermediate, or exports, you’ll find something useful in our collection of After Effects tutorials. Adobe After Effects is mainly used to create visual effects for commercials and movies but you can also create image slide-shows, some small videos, transition effects for websites and stuff like that. A series of online tutorials for Adobe After Effects. Our training has been designed around the belief that you don’t need a degree and a decade of experience to become an effective MoGraph artist. You just have to know what’s important to focus on, and you need to understand the fundamentals involved. Coming from the world of graphics & animation combined with great passion for teaching, Eran has taken upon himself to “Spread the Word” of his expertise on Motion Design. A collection of video tutorials explaining DaVinci Resolve tools and workflow. Black Magic Design released the public beta version of the renowned color grading program DaVinci Resolve. We searched for the best resources that showcase the awesome new power of DaVinci Resolve 12. Denver Riddle provides training for DaVinci Resolve. Some are free, while some require membership. “Learn more about this amazing grading software and my membership training!”. A resource for filmmakers. Grading techniques from an industry expert. DaVinci Resolve is the world-wide leader in color correction software but at version 11, it has a TON of features. Do you know which are the important features to learn now? Filmmaker Central is your resource for learning and collaborating in the world of filmmaking and broadcast. Find relevant and straight-forward tutorials from professionals in the industry on everything from film making fundamentals to specialized production and post-production skills. If you know of any other great learning resources for post-production, please email us and we will add them to the site. Edit your films like a pro when you harness the power of Adobe Premiere. In this Vimeo Video School series, we’ll walk you through Premiere’s hefty video-editing toolset, from basic functions to advanced settings. Film Riot is a YouTube channel that serves as an on-demand film school. Follow the link for their video editing playlist! A community-driven source for post-production information. Tips for better Editing: – this is not about editing programs, but principles. Incredibly useful text for people who are starting out; most professionals will have mastered these guidelines of matching action & camera movement. With a bit of patience and experimentation you’ll be producing smoothly edited videos in no time. For an overview of what you can do in a standard editing program watch the video below. A collection of video tutorials explaining Final Cut Pro X tools and workflow. Various tutorials for FCPX and more. A comprehensive set of tutorials for Final Cut Pro X, from basic to advanced by Dan Allen. Denver Riddle provides training for FCPX and DaVinci Resolve. Some tutorials are free, some require membership. Denver also shows how to use his own plugin Color Finale. 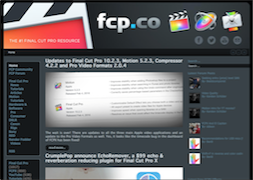 Aiming to be the number one Final Cut Pro resource on the net. A collection of video tutorials explaining FCPX and its workflow. This series walks you through Final Cut’s video-editing toolset, from basic functions to advanced settings. A YouTube channel with guides to colour grading and lots of other vfx. A free guide to color grading in Resolve, with tutorials for beginner, intermediate and advanced users. Grading tutorial from FCP.co – Aiming to be the number one Final Cut resource on the net. When Apple introduced the new FCPX, it came with a newly designed color correction interface. 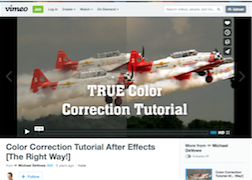 On this page you’ll find complete color grading training for FCPX. Larry Jordan is a producer, director, editor, author, and trainer with over 35 years video production and post-production experience. A paid service – Learn the art of video editing from our expert instructors using popular video editing software like iMovie, Final Cut Pro X, Premiere Pro, and Media Composer. The art of deciding when to cut (and when not to). The cut, the straight transition in which one clip starts and is immediately followed by the start of the next clip, is the staple of video editing. Without the cut, there is no such thing as editing. 7 Simple Tips To Make Video Editing Easier For Beginners. Links to online learning resources for Post Production. Motion Array is a great resource to take your video production to the next level with the professional touch that motion graphics add.